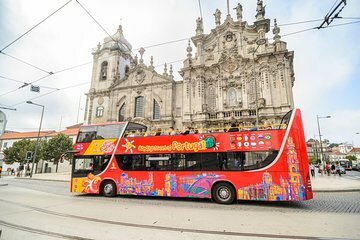 Explore a resplandecente cidade do Porto no seu próprio ritmo com uma excursão de ônibus com várias paradas. Em uma das 38 paradas convenientemente localizadas, você embarcará em um ônibus diferenciado de dois andares e se sentará no andar superior para apreciar excelentes vistas da cidade. Ouça comentários de áudio informativos, enquanto passa por monumentos icônicos como a Torre dos Clérigos, o Jardim do Morro e a Catedral da Sé. Escolha entre duas rotas e opte por permanecer no ônibus durante todo o percurso ou desembarque sempre que uma atração chamar sua atenção. Desembarque para desfrutar do esplendor do litoral da Praia do Ourigo — a belíssima praia do Porto — ou enriqueça seus conhecimentos culturais no Museu de Arte Sacra, no Museu do Vinho do Porto ou no Museu Romântico. Além do seu bilhete de ônibus de 2 dias, você poderá fazer uma visita gratuita a uma das seguintes adegas: Cockburns, Quevedo ou Porto Cruz. Consulte o Itinerário para obter uma lista de todas as paradas. During our two days at Porto it was pouring, but this a great tour. Highly recommended during a good weather. Great way to get around see and hear about Porto. The narrative is slightly off because of the traffic at times. These tours are a must for me, as they give me a good idea of the layout and history of the city. This tour was no different. This is a good way to get an overall view of Porto. I found the narrative to be sparse and the fado music repetitive and annoying played repeatedly when there was no narrative, which was most of the time. Check out the competition and see whether the Yellow bus has a better route for you. Their narrative is much better and so is their music. The red bus system has too few buses and the driver spends interminable amounts of time issuing tickets to passengers joining the tour. We spent 1 hour 10 minutes twice waiting for buses that should have been 30 minutes apart. USE THE YELLOW BUS! This is a great way to get a bird's eye view of Porto, especially if you take both tours as we did. Much as we enjoyed the tours, there were issues. Firstly, when we joined the first tour Blue route, the driver didn't wait for his passengers to sit down before driving off. As a result, my wife was almost thrown down the stairs as the bus lurched forward. Secondly, the commentary was almost obliterated at times by a poor connection and constant interference. If we visit Porto again, we would consider using the Yellow or Blue bus City Tours!